Microsoft Dynamics NAV is a business management solution for small to medium organisations. It offers customers a full solution for their business with greater control over their financials and business processes. The Power BI content pack provides out-of-box reports for Dynamics NAV users, such as sales and profit, opportunities pipeline, profitability and more. These metrics are organized on a dashboard that can be fully customized, allowing you to easily connect and immediately start exploring your data. You can connect with Microsoft Dynamics NAV with Power BI, which can provide out-of-box reports for Dynamics NAV users. Power BI has the ability to transforms your company's data into rich visuals for you to collect and organize. 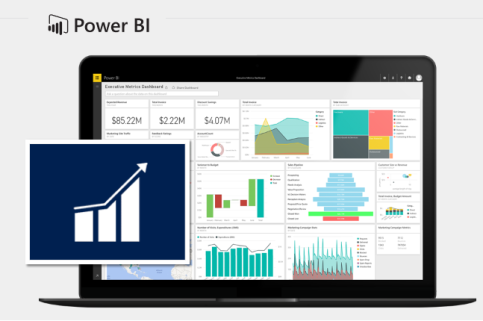 With Power BI in Dynamics NAV, you can analyze your information, see all of your data everywhere, from on-premise to the cloud, together in one place. Power BI has "pre-built" dashboards to explore your information in incredible details. Also, you can create interactive reports for deeper business analysis in a matter of moments. View "live" business information with "real time" updates to keep you on top of changes as they happen. Utilize visual data to share and collaborate with visually stunning presentations such as Pie Charts, Bubble Charts, Geographic Maps, Data Tree Maps, Funnel Charts and more. To import your Microsoft Dynamics NAV data into Power BI, you need to have permissions to the sales and finance data tables where data is retrieved from. The tables are also required to have some data, empty tables will currently fail to import. You can explore more features at PowerBI Feature. Click here to get started document.